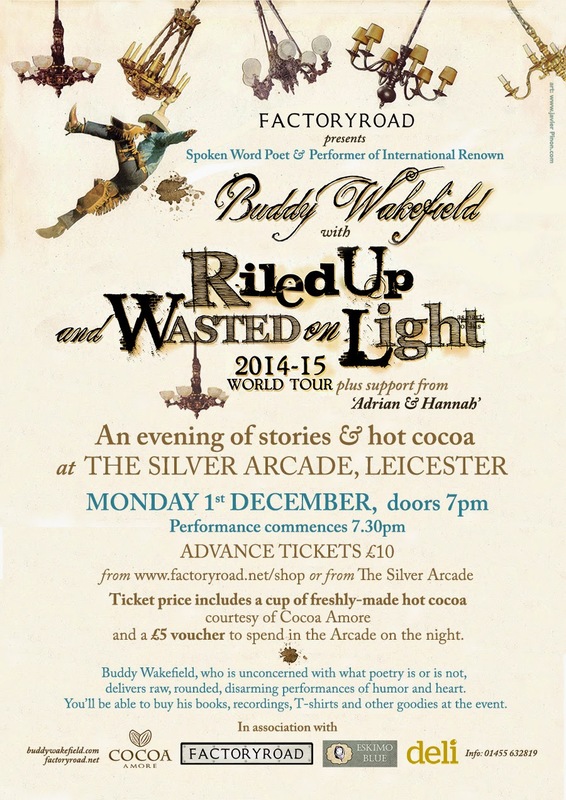 Here is what to do on Monday December 1st in Leicester: See Buddy Wakefield in a large old bright arcade. He's been on tour for the past three hundred days. He'll big you up. He'll redeem all your coupons and put diamonds in your cupboards. He has lasers for eyes. Local support will involve three voices voicing a three-voiced thing I wrote. I can't be there to see this happen but I am excited about it and maybe you can go instead and tell me how it went, please, thanks. Buddy is also in Bristol on December 3rd at The Birdcage, and most of the other places in the UK afterwards. Have a look at the tour. See him. He's good.